I didn’t know what to expect for my trip to Brownsville. Would it feel like a ghost town? Would I hear gunfire? Would someone confront me? Or worse? Even though the Times had written on recent violence in the area, I wasn’t overly worried, but I did take a few precautions. I didn’t bring my wallet – just my MetroCard and ten dollars (with an extra fiver hidden in my shoe, just in case). I knew I’d stick out like a sore thumb no matter what, so I dressed down: ratty old t-shirt and shoes, khakis, old glasses. The iPhone had to come, though; I very briefly considered buying a disposable camera, but I felt the risk of loss was worth the reward of quality pictures. I also designed my journey around the subway, for at least two reasons. First, if I was in a tight situation, I could make a break for the turnstiles. (I’m a runner, remember.) Second, both lines in Brownsville, the 3 and the L, are elevated. This would allow me to photograph the area from the platforms without being conspicuous. With the advance planning I usually give to half-marathon, I was off. It took me a while to feel easy taking my iPhone out of my pocket, but eventually I was comfortable (but not recklessly comfortable) doing so. I took the 3 to Sutter Av/Rutland Rd, a stop I have used several times to cut short runs. It was a popular stop at 1 in the afternoon. I was expecting to see large projects, but there were only a few smaller NYCHA buildings in this area, and several private residences. I was pleasantly surprised to see a community garden: the Howard Avenue Garden. I cut back toward Livonia Avenue, onto which the 3 winds. I saw my first open lot of the trip; I would see several more, although none so overgrown. I love coming across murals. Even if they’re mediocre, they’re much better than another boring, unpainted wall. They can also serve as a source of pride for the neighborhood and for the artists. Betsy Head Park is one of the oldest parks in Brooklyn, dating from 1915. It has a pair of baseball fields, a track, and a swimming pool, among other facilities. Like Sunset Play Center, the Betsy Head Play Center is a 1930s WPA project with many art-deco elements. Unfortunately for me, it was closed for repairs, so I couldn’t go inside. Trash collected in many spots: on overhangs next to the subway, in vacant lots. The farther east you get in central Brownsville, the more projects you see. They are enormous – it is difficult to describe in words how they loom above you. Time Magazine’s LightBox has a photo-driven piece on the area; the first photograph of the slideshow gives a sense of the scope. The picture appears to have been taken from a building on Sutter Avenue between Rockaway Avenue and Osborn Street. One spot I wanted to check out was the Stone Avenue Branch of the Brooklyn Public Library. 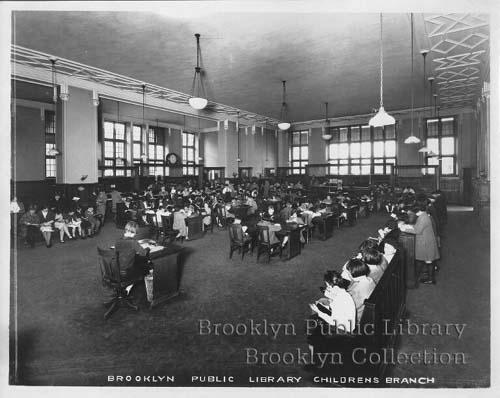 It opened in 1914 as the Brownsville Children’s Library, the first library in the United States devoted to children. The building still has the same high ceilings it did when it first opened. Upstairs is the Brownsville Heritage House, which seeks to preserve Brownsville’s history and to teach it to successive generations. To get to the Stone Avenue Branch, I decided to walk on the project-lined Dumont Avenue. As I went through, I passed a “Kool Man” ice-cream truck playing a jingly version of “Do Your Ears Hang Low”. The juxtaposition of the song, the silence otherwise, the tall buildings, and the voice in my head telling me I shouldn’t be there was creepy. When I got to the Junius St stop on the 3, I felt like I was in good shape. I was surprised to see another community garden from the platform. This is the Powell Street Community Garden. About a dozen workers were manning the grounds. I did this transfer once at night to get to Bushwick. Not the brightest idea. I took the L train south one stop to New Lots Av. All three L train stops I saw had cool stained glass, some in triptychs, some in single panels. Here are three individual scenes from New Lots Av. This area is almost exclusively auto-repair shops. Where do they get the business? On Junius Street, I came across the coolest mural I’ve yet seen, its status secured because I love The Twilight Zone. The most beautiful thing we can experience is the mysterious. It is the source of all true art and all science. He to whom [this] emotion is a stranger, who can no longer pause to wonder and stand rapt in awe, is as good as dead: his eyes are closed. With some pep, I headed down to Brownsville Recreation Center. I asked to use the restroom, and poked around for a minute or two. Outside is a park with a nice turfed baseball field, handball areas, and basketball courts. Inside, I saw a pool, several ping-pong areas (which were in full use), and another basketball court. The Rec Center was one of the sites of a recent music video by Edward Sharpe & the Magnetic Zeros. I really wanted a picture of the skull puking basketballs (0:38 in the video), but I felt I had already overstayed my welcome. Linden Avenue serves as the southern border of Brownsville. Below it is an MTA yard. Back on the L up to Sutter Av. Have you ever seen an officer of the MTA’s Transit Police? In Brownsville, there was at least one at the entrance to every station. The area bordering East New York is apparently known as the East Brooklyn Industrial Park. A metal shop offered cold hard cash for my junk car: $16 per 100 pounds. Pitkin Avenue is the main industrial strip of Brownsville. It’s named for John R. Pitkin, who in 1835 was the first to divide New Lots into, well, new lots for building. For the most part, it feels like a slightly nicer version of Flatbush Avenue in Flatbush. Most stores have huge awnings blaring their names and purposes. I did see a few “quieter” buildings. I also saw something unfortunate: many windows along the avenue had been boarded or even bricked up. Lunch was at Pitkin Caribbean Bakery. I had a beef patty in coco bread, homemade carrot juice, and a coconut pastry. I had never thought to put nutmeg into carrot juice, but it might be a requirement in the future. Overall, this was a delicious meal. In a sign of the area, the counter was behind bullet-proof glass. Here’s a beautiful terra cotta building spanning the block between Herzl Street and Amboy Street. Also, that quintessential Brooklyn sight: shoes on a wire. The ornate former Loew’s Pitkin Theatre is on the western end of Pitkin Avenue. It opened in 1929 and has been mostly unused since the 1960s. Renovations are being done to convert it to a charter school with retail space. Zion Triangle is a small park opposite the theatre with a name invoking the area’s Jewish past. A monument from 1925 honors residents who fought in World War I. My eyes had been peeled for stars of David, and this was the only place I found one. Perhaps I wasn’t looking hard enough; perhaps time has washed away visible reminders of history. My trip successful, I headed back to East 98th Street to Sutter Av/Rutland Rd, where my journey had begun. This post should not be taken as an endorsement to walk around Brownsville – even with a plan. I wanted a companion, but couldn’t find a partner, so I struck out on my own, taking several precautions. I had conversations with only two locals: the man at the bakery, and an older woman soliciting signatures for Anthony B. Jones, candidate for the Democratic nomination for the 55th Assembly District. This entry was posted in Visit recaps and tagged beef patties, BMT Canarsie Line, Brooklyn, Brownsville, carrot juice, IRT New Lots Line, Junius St-Livonia Av transfer, shoes on a wire, stained-glass windows, Twilight Zone, Week 13 - Brownsville. Bookmark the permalink. What bothers me is that so much trash is allowed to accumulate. It would not happen in Lower Manhattan, why should it be tolerated in Eastern Brooklyn? This was interesting to read since most of my friends from other neighborhoods are too scared to come visit so I’ve never heard an outsiders perspective. You picked some crazy places to walk through (Sutter ave, Betsy Head Park, and New Lots there’s alot of gangs around there) but you did a good job of capturing what its like I’ve never really noticed how deserted it can look at times. Glad you liked the post. My trip to Brownsville was one of the most eye-opening experiences I’ve ever had. I’m happy I was able to convey the “deserted” feeling I got there. My experience with the ice-cream truck still pops up frequently in my mind, and it’s not a welcome thought. I can trace my family to Brownsville mid- 1800s..relatives still live there. The changes of the area landmarks and peoples were always topics around the family Sunday dinner table and one of the key comments for each generation was that Brownsville was always a tough area and more dangerous for outsiders than those who lived there – in the end it was home to us all – Thanks for the photo visit! Thanks for coming by and sharing, Simone! I’m glad you enjoyed this post.